Outshooting an opponent by 5-0 through the first nine minutes of play usually sets a tone that can lead to a win, or at least a strong showing. When that opponent is Harvard, though, a machine that combines stunning offensive efficiency with a netminder who can stop almost anything, such a strategy - as with most strategies - fails to deliver. 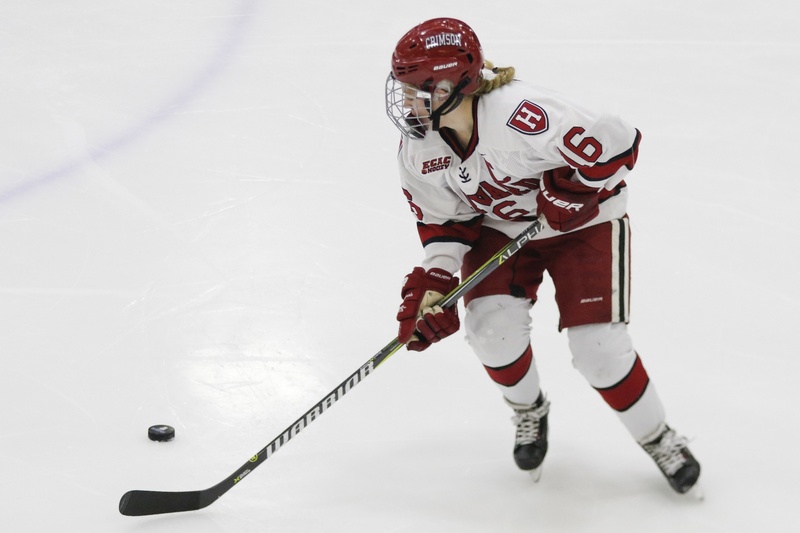 Continuing to contradict classic hockey logic, Harvard was outshot by 33-23 but emerged with a crushing 5-2 victory to take the first game of its best-of-three ECAC quarterfinal series at No. 9/9 Colgate. Never looking back after scoring the first point, the Crimson (12-13-5, 10-9-4 ECAC) notched its first victory over the Raiders (21-9-5, 15-4-3) since winning an ECAC quarterfinal meetup in 2016. Despite the dominant final tally, a 2-1 Harvard lead heading into the third might have made for a nail-biter - but the Crimson had other ideas. Two minutes in, junior forward Kat Hughes saw co-captain Lexie Laing near the post. Laing hit it right back to Hughes, who one-timed the puck for the score to extend the Crimson’s lead to two. During a power play 67 seconds later, Hughes struck again to hand Harvard a second security goal, prompting the Raiders to switch netminders. After putting up four goals through the first 28 matches of the season, Hughes has doubled that count in a week, adding four in the last three games and five in the last five. By now, the Crimson was cruising, making good on four of its 14 shots to boast a nearly 30 percent shot-to-goal conversion for the night. A minute and a half later, Harvard pounded a final nail into the coffin, this time on a five-hole shot from sophomore forward Becca Gilmore off an assist from sophomore defender Emma Buckles. Colgate continued to pressure, but a power play goal with six minutes left failed to reinvigorate the Raiders. Time expired, and the Crimson headed to the locker room with a 1-0 series advantage. The game had been a true team effort, with nine different Harvard players on the scoresheet. The first opened nearly as auspiciously for the Raiders as the third would for the Crimson. Aside from several impressive saves from freshman goalie Lindsay Reed through the first nine minutes, Harvard offered little, coughing up precisely zero shots and yielding five chances to Colgate. Then, a flurry of offense just before the period’s midpoint set the stage for the remainder of the contest. On its third shot of the contest - a zinger by sophomore forward Keely Moy from just inside the right circle - Harvard was on the board. The game held tight through the first part of the middle frame. Then, for the second time that night, Harvard converted as a period neared its midpoint. In the first iteration of a connection that would prove crucial to putting the game away, Hughes saw Laing, and Harvard was up by two. Colgate netted its first score nine minutes later to leave a sense that it was still anyone’s game. In the postseason, though, there are no ties, and victory could only go to one side. Harvard’s players decided that it would be them. A commanding start to the third, and the contest was over. The ECAC quarterfinal series against Colgate continues Saturday, with the puck drop slated for 3 p.m. A Harvard win means a ticket to the semis - a loss, and the Crimson refocuses for a season-deciding matchup on Sunday.